Ever wish you had a cultured snack you could make in less than five minutes and have ready to grab whenever you wanted some serious snacking? These frozen yogurt bites are the true definition of both simple and satisfying. Not Just Tasty, But Cheery Too! Raspberries are a particularly delightful fruit. Not only do they give a pop of color to anything and everything (they're a great option as a homemade food coloring), but they boast the lowest natural sugar content of all the various berries, providing a sweet treat with a minimal sugar load. They also freeze well, so I love to stock up when they're in season and toss pounds and pounds of them in the freezer to use all winter long as a bright, cheerful addition to winter meals. Even better, these frozen yogurt bites are a perfect way to showcase raspberries' joyful splash of color and sweet flavor. Our family clamors for them both in the deep of winter when we need every bright, cheerful, antioxidant-rich food we can get our hands on, and in summer, when cold, nourishing treats provide welcome refreshment in the heat. All this said, these treats are extremely versatile. There's no reason you MUST use raspberries — any other berry or chopped fruit works just as well. I've used mango, limes, and blueberries on a number of different occasions and we've enjoyed them all. Yogurt is a particularly versatile cultured food, which is part of why it's so popular. Yogurt teems with living bacteria that help keep your body’s systems in balance — especially your colon, which is essential for your body to be able to absorb the full range of nutrients you eat, and supports healing from gastrointestinal disorders such as Irritable Bowl Syndrome, acute rotavirus gastroenteritis, and other diarrheal diseases (source and source). So in addition to all the other benefits of eating plenty of cultured and fermented foods, yogurt is certainly welcome at snack time! And whether you're using it as a marinade for tandoori chicken, a topping for breakfast, as a dessert, or as these yummy frozen yogurt snack bites, it's a quick, easy way to up your intake of those lovely micro-organisms that help keep our guts happy and healthy! There are two ways to make these treats, in mini-muffin tins or by slicing into bite-sized cubes. Both are simple and require minimal ingredients. Thankfully, they are also both stunning and delicious, so sharing is highly encouraged. Makes approximately 24 frozen yogurt bites. Set out mini-muffin tins (enough to make 24 frozen yogurt bites). Silicone or other flexible mini-muffin tins are highly recommended, but you may also line a standard tin with liners, if preferred. In a large bowl, whisk together the yogurt, lemon zest, and honey until smooth, then fold in the frozen raspberries. Spoon into the mini-muffin cups and freeze until firm (two to four hours, or overnight). To store, pop the frozen yogurt bites out of the muffin tin, then place in an airtight container and store in the freezer for up to one month. To serve, let stand at room temperature for about five minutes before serving. 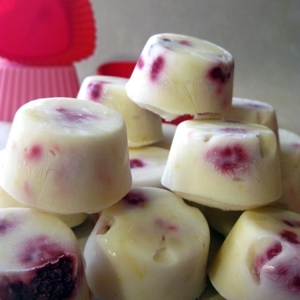 Makes approximately 24 to 36 frozen yogurt bites. Set out a loaf pan, baking dish, or rimmed baking sheet and line with parchment paper. Don't skimp on the honey, even though it's more than in the recipe using mini-muffin tins. This keeps the mixture smooth and cut-able once frozen, due to the higher water content. Pour the yogurt-raspberry mixture onto the parchment paper and smooth out to make it about 3/4-inch thick (more or less is fine, if necessary). Freeze until very firm (three to four hours, or overnight). Place on a cutting board and peel off the parchment paper. 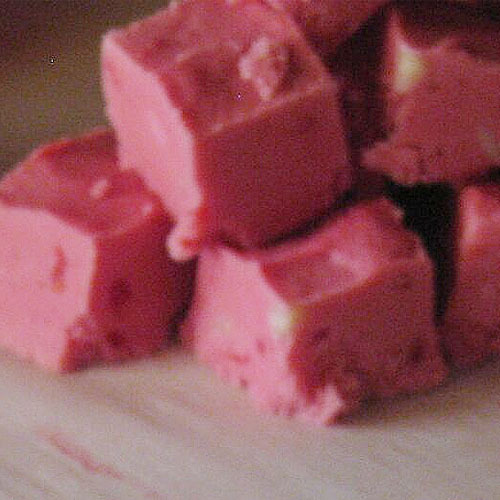 Slice into bite-sized cubes, then place in an airtight container and store in the freezer for up to one month. 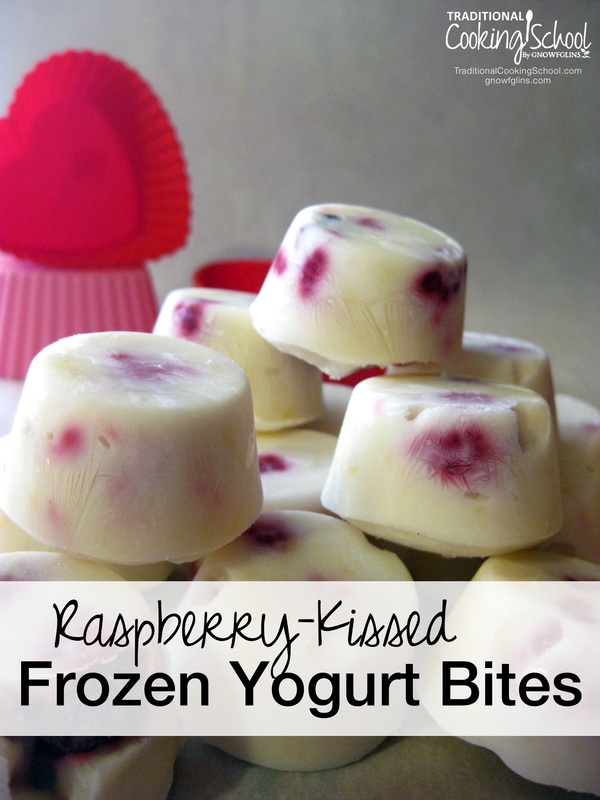 Don't you want to make these lovely Raspberry-Kissed Frozen Yogurt Bites TODAY?! This post was featured in 24 Easy Summer Treats Kids Can Make Themselves, 51 Cold Summer Desserts, and 47 Trim Healthy Mama E Meals & Snacks With Traditional Foods. Oh, yum! I make Wardee’s raw milk yogurt from the milk of our Jersey cows. I also make kefir smoothie pops for the freezer. These will be another awesome frozen treat!